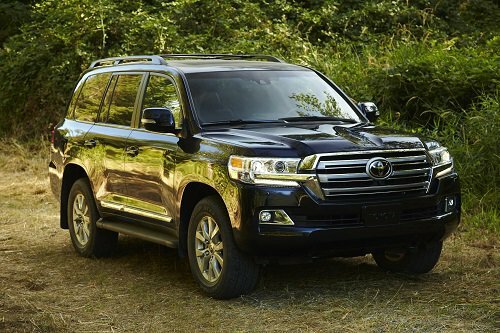 The 2017 Toyota Land Cruiser is a large luxury SUV offering a large number of amenities, a stylish interior and excellent off-roading capabilities. It’s powered by a 5.7 liter V8 engine with an output of 381 hp and 401 lb feet of torque. Towing capacity stands at 8,100 lbs. Full-time four-wheel drive is standard. The luxurious interior offers upscale materials and wood accents. Seating is available for 8 passengers with leather appointed and adjustable seats. The front seats offer temperature control options. Interior features include a premium sound system, a 9″ lcd screen, a navigation system, USB ports, bluetooth connectivity, a moonroof, push button start, rear parking sensors, HD radio and a forward collision warning system. Cargo space stands at 16.1 cubic feet which is expandable to 43 cubic feet with the rear folded and to 81.7 with the second and third row folded. Available safety features include air bags, brake assist, night vision, auto-on headlights, a blind spot monitoring system, ABS, daytime running lights and brake assist. Contact us if you are interested in test driving the 2017 Toyota Land Cruiser in Orange County, CA.